HG Tip! If cooking your chicken from scratch, use nonstick spray (not oil) to keep the fat count down. **These short, sweet cucumbers rule in this recipe! But if you can't find 'em, any cucumber will do. Hmmmm... let's see... Why would this chicken salad have an average of 30 grams of fat per serving? It's just chicken -- in salad form, right? 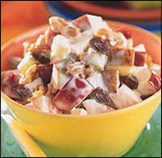 Yeah, um, it is if you consider mounds of mayo and handfuls of walnuts "salad" (FYI, we don't). But those crazy stats don't stop this poseur, which was created at the famous Waldorf Astoria Hotel in NYC, from being super-popular. Guess people just LOOOOVE chunky chicken, raisins, nuts, and apple pieces slathered in creamy goo. Rather than indulging in this fowl faux pas, enjoy our version instead. It's just as creamy, sweet, and delicious, and it's more creative -- we use cucumbers instead of celery (everyone knows cukes are WAY better than celery!) and big fat juicy grapes instead of shriveled raisins. And no, you won't even miss the nuts (promise!). Today, April 8th, is National Empanada Day. Watch out... a typical beef empanada serving (2 smallish ones) packs in around 425 calories and 30 grams of fat. Ay caramba! 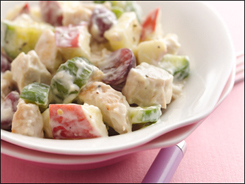 This chicken salad recipe is the opposite of bad. You NEED to share it with at least a dozen people. Click "send to a friend" NOW!